Treated Decks - Cedar Rustic Fence Co. Looking for a beautiful deck that won’t break your bank account? Are you concerned about the health hazards with treated decking material? No need to worry. Get a MicroPro treated deck from Cedar Rustic. 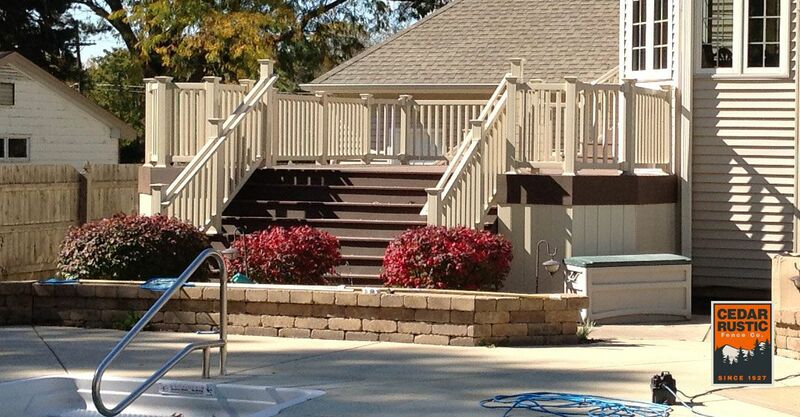 MicroPro is a revolutionary technology that is used to pressure treat wood material for decks. It uses micronized copper preservative to protect against rot and decay. It does not use any of the harmful materials used in other treated decking material so it is completely safe for the environment and for your family. Relax and enjoy the outdoor with your new treated deck from Cedar Rustic. Each Cedar Rustic Deck is warrantied for three (3) years against defects in workmanship. Gate closure and locking mechanisms are warrantied for one (1) year against defects in workmanship. Warranties do not cover damage caused by Acts of God, weather, impact or other conditions beyond the control of Cedar Rustic Fence Co. Customer failure to pay in accordance with the Contract voids all warranties. All other warranties expressed or implied with limitation warranties of quality, fitness and merchantability, are excluded.